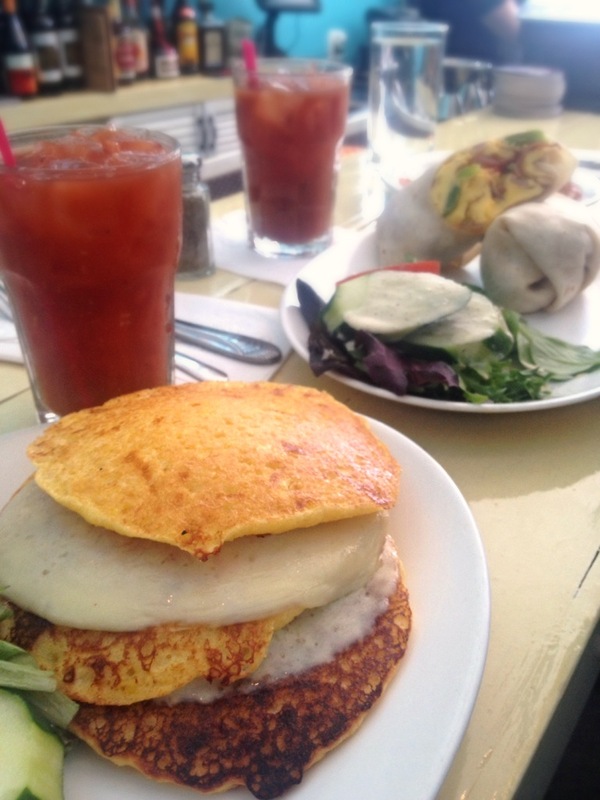 Last night, Astoria’s Twittersphere burst with the news of Fatty’s Cafe’s official reopening. My Sunday plans immediately went out the door, particularly since the new spot is exactly 9 (Nine. N-I-N-E!) minutes from my doorstep. So instead of washing the loads of laundry beckoning for some attention or storing away the winter clothes taking over my closet, I headed over for their first brunch. Tucked away on 28th Avenue and 45th Street, the location is light and cheerful. The menu stays true to its roots unchanged. I ordered my usual – the polenta cakes topped with provolone and a side of black beans. Gah, those slightly sweet, savory cornmeal cakes are just heaven every single time. 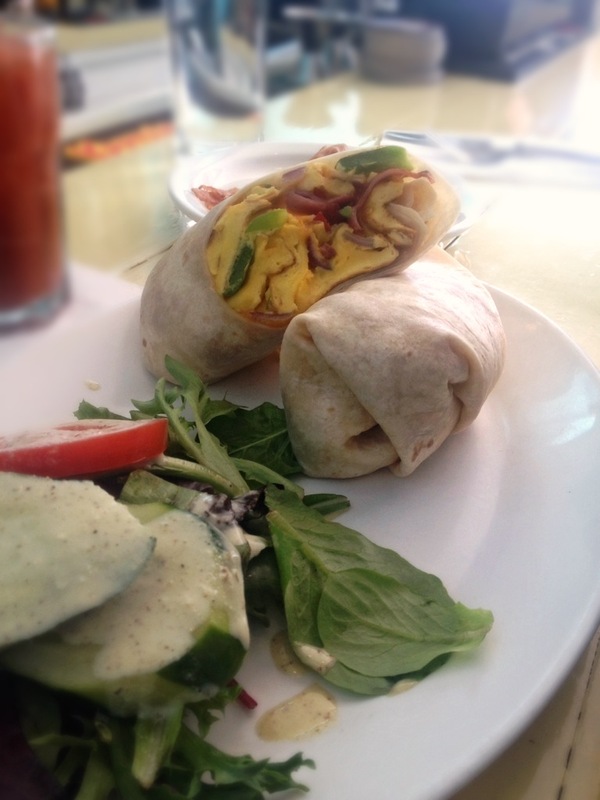 Baalok also had his usual – the breakfast burrito. We ate and ate, leaving giddly content and happily waddling home in a food daze. Although the opening is bittersweet, Fatty’s new spot is pretty awesome. The bright space is bathed in Caribbean blue paint with a pale yellow bar housing an eclectic bar tap made of a guitar amp and microphones. As always, the owners Fernando and Sue were gracious hosts, taking time to speak to everyone. Eventually there will also be an outdoor patio; they hope to have it open by summer. I can’t wait to go back. Check out the new design at We Heart Astoria. Pizza bites – we’ve all done it. They’re simple and good. As a (broke) college student, I loved fixing my own English muffin rendition with Penzey’s sandwich sprinkle, slices of red onion and provolone. Pop it into the toaster oven for a few minutes and voila! Recently I’ve been thinking of ways to reduce costs in the kitchen and these little bites of goodness popped into mind. As I was browsing Union Square’s Greenmarket yesterday, I came across the soft, olive oil-y Focaccia loaves by Hot Bread Kitchen. My mind went straight to pizza bites. Focaccia works well as a pizza dough substitution so I picked up a few additional ingredients – beets, mushrooms, micro arugula and fresh ricotta. Focaccia bites are so quick and adaptable; they pair perfectly with a hectic workweek. Below are just a few of my favorite combinations. Each one is made with ingredients from the Greenmarket or my kitchen, making for a stress-free, thrifty – oh, and delicious – dinner. 2. Beet Bite – Top two squares with ricotta and thinly sliced beets. Drizzle with olive oil. Before serving, sprinkle fresh chives and pepper on top. 3. Vodka Bite – Vodka sauce serves as the base. Top with mozzarella slices and a crack of pepper. Before serving, place basil leaves on top. 4. Micro Bite – Drizzle bread with truffle oil and top with ricotta and Fontina. Before serving, cover with micro arugula. Add whatever toppings you like and pop into the oven at 350˚F for about 10-15 minutes until cheese is melted. 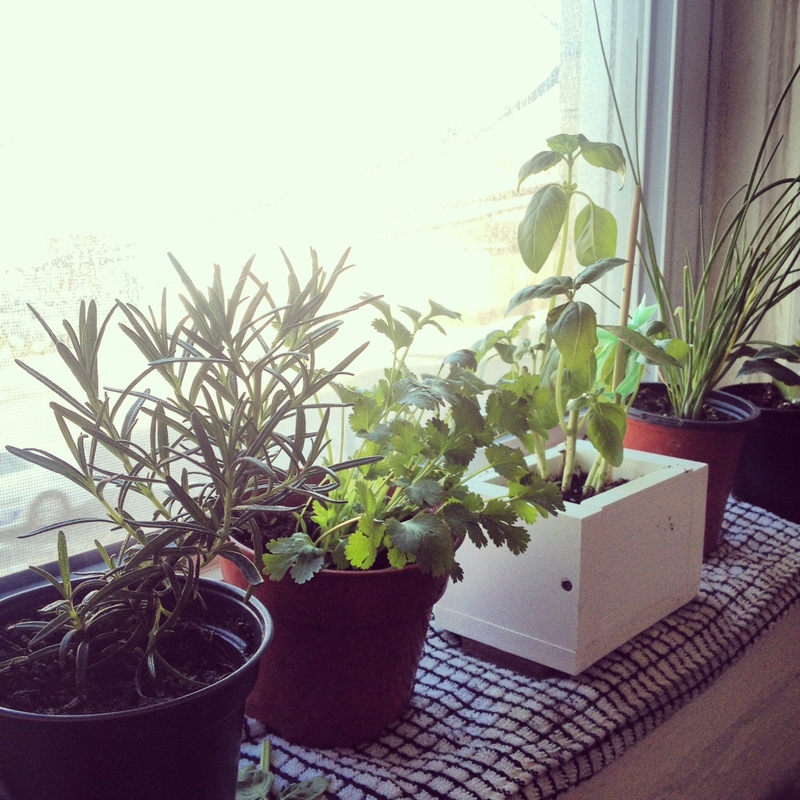 Sidenote: The herbs came from my new tiny herb garden. Find some tips for your growing your own here. A friend had left over PVC from a project and made all of us planters. Mine was a perfect rectangular box fit for a window sill. He even potted a basil plant inside. So at the Union Square Greenmarket, I picked up cilantro, bay leaf, chives and rosemary plants (4 for $10!) to start a little herb garden. I quickly fell in love with the small connection to nature in the midst of seemingly little, and the benefits of fresh herbs in the kitchen. On the down side, I quickly learned I did not inherit my mother’s green thumb. It seems to be rather purple or dark blue. I placed all of the herbs in separate pots in direct sunshine. I watered the little things and harvested when needed. But they just stared at me indignantly and drooped. I even tried talking to the plants. Maybe they just needed a boost of self-confidence?! So after searching “my indoor herbs won’t grow” oodles of times on Google, I found a few tips. Read on if you’re a beginner like me. 5. Preserve fresh herbs by wrapping the stems in a moist paper towel and store in a plastic bag in the fridge. Via the Kitchn. Got any indoor gardening tips? I’d love to hear! Happy April! At the first of each month, I’ll be sharing what’s on my to-do list for the four weeks ahead, whether it be in the kitchen or Astoria. April highlights include a local favorite reopening and Queens Beer Week. What are you excited for this month!? 1. Fatty’s reopens! Yesterday, the Village Voice’s Fork in the Road reported that Fatty’s Cafe (!) is opening on 28th Avenue in mid-April. Their sweet little polenta cakes stacked with provolone are so simple and delicious. I’ve tried recreating them at home and it’s just never the same. 2. Astoria Performing Arts Center Raffle. We Heart Astoria spread some community love and support about APAC’s new fundraiser. Ticket buyers could win an iPad, a “Taste of Astoria” prize and gift certificates to several local restaurants and shops. 3. LIC Flea. The food and flea market opens this Saturday at 10am. For more info, check out their website. 4. A weekend getaway to D.C. with Baalok. This has nothing to do with Queens or cooking. However, the anticipation of this weekend just makes me warm and giddy with excitement. 5. Spring cocktails. Let’s celebrate spring with one of these light and refreshing cocktails from The Kitchn. 6. Queens Beer Week. According to DNAInfo, Queens Beer Week kicks off April 19th. 9 glorious days will showcase Queens’ burgeoning beer scene and local breweries.